This is where you make all of your targeting selections and decide the audience of your push campaign. Click the "Add conditions" button to see the list of native and custom conditions you can add to your campaign. By default, if you don't select any group, Batch assumes you intend to target your whole audience. You can organise your conditions into subgroups. This allows you to use different AND & OR operators between each group of conditions. Smart Segments are automatically generated by Batch from the moment the SDK is implemented in your app. They allow you to take action on your userbase in a meaningful manner, based on their engagement level. The NEW segment contains newcomers to your app that haven't yet established themselves as engaged, lasting users. They're still trying to understand what your app can do for them or how amazing your game is. Don't overwhelm them with information they don't need or repetitive notifications. Use Batch to welcome them and present them with the features they may need to discover in order to engage them from the start. E.g. Send a welcome push notification to New users only (1 daily recurring push campaign with a capping of 1). Users of the ENGAGED segment are your regular users. They open your app frequently, they enjoy it the way it is and know exactly why they're using it. For all these reasons, they are the most receptive users you have and you want to keep them engaged. Don't bother them with random push notifications to promote basic features of your app or to remind them to come back. They already do. Communicate the aspects of your app they probably don't know about yet, make them discover new features after an update or show them you care about them with special offers. E.g. Automatically send your users a notification when they become Engaged (1 daily recurring push campaign with a capping of 1). One-timers are users who did not come back after they first launched your app. They probably didn't understand what your app can do for them, installed your app and forgot to come back or they just didn't want to go further if your app has a login. Still, they might come back in the future if you send them the right message. Don't send them notifications too often asking them to perform a specific actions in your app. They probably don't care. Focus on what they probably miss or they can obtain from using your app. E.g. Entice One Time users to come back with a weekly notification (1 weekly recurring campaign for one timers with capping). Dormant users were 'engaged' at one point, but have not launched your app for a long time. They're basically not using it any more, but they still remember it and probably why they installed it. Don't just ask them to come back. Give them a good reason to start using your app again such as new features, a special offer or anything showing that you've improved since their last session. The imported segment contains all the push tokens we have imported if you migrated from another push provider. You will find more information on how to import your tokens here. These users will be progressively analyzed and transferred to other segments after their first session. Custom audiences allow you upload static segments exported from your userbase (e.g. top 500 buyers, etc) or created by third-party tools like Tinyclues for example. You can easily retarget these custom audiences with a push or an In-App campaign from the dashboard. Custom Audiences are available on the Business plan or higher. 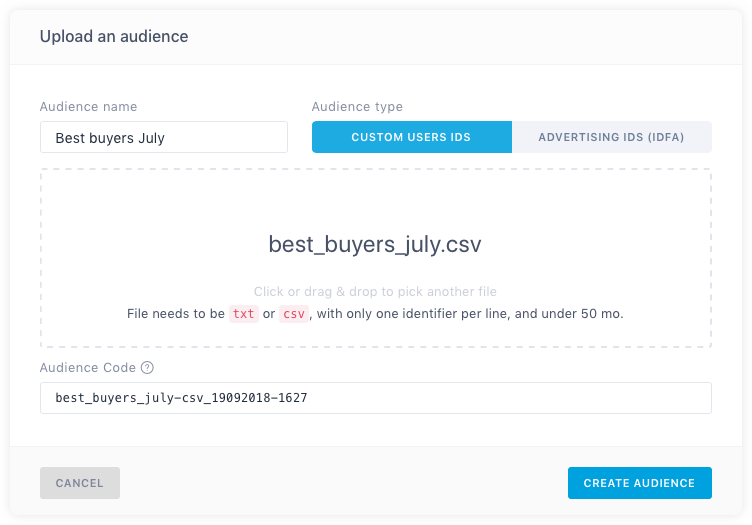 You can create a custom audience using the Custom Audience API or by uploading a .CSV or .TXT file to Batch from the dashboard settings > Audiences. A custom audience can contain a list of custom user IDs or advertising IDs (GAID or IDFA). You can also use the "Custom audience" attribute. Click the "Add conditions" button, then go to the "Native attributes" tab to find it. This is useful if you are planning to include a custom audience in complex segmentation with different operators (AND/OR). You can also use it to target or exclude up to 3 different custom audiences. Batch automatically detects the country and the language of your users. This allows you to easily limit the range of your push campaign to one or several countries/languages with only one click from the dashboard. No need to segment your database yourself. You can leave this section blank to target globally, or you can specify your grouping of countries by using the drop-down menu or typing. There is no limit to the number of countries you can select. Leaving this section blank will target all languages and increase the reach of your campaign. If you don't have a message in the language of a user (e.g. Japanese), Batch will deliver the message in the default language of your app. You can check the default language of your app in ⚙ Settings → General. If you only want to send a notification to users speaking a specific language, then you can target them here. It may be useful if you want to target a multilingual country and you only have a message in one language. Native attributes allow you to target users based on data the SDK collects automatically. Several conditions can be set in the same campaign and with different operators (equals to, lower than, greater than, etc). On iOS, the device type attribute value must be a valid model name. The full list of Apple model names is available here (e.g. iPhone8,1, iPad2,1, etc). On Android, the device type value must be the name of a valid device. A list of all the devices supported by the PlayStore is available here. Make sure you chose a value in the "model" column (e.g. SM-G900H). Allows you to target users based on the number of hours / days elapsed since the install. The days are counted in sections of 24 hours from the hour of install. With this attribute you can easily create several onboarding campaigns, sent several days after the install (e.g. D +1: Welcome message / D +3: Recommend a feature / D +8: Rate the app). The last push date attribute allows you to target users according to the last date they received a push via the dashboard or the Campaigns API. The days are counted in sections of 24 hours from the hour of last push. This is especially useful if you want to avoid bothering users that have already received a push from you lately. The Last visit date attribute allows you to push users based on the time elapsed since their last visit. The days are counted in sections of 24 hours from the hour of the last visit. This is useful to reengage users who haven't opened the app for a while. Allows you to target users based on the mobile carrier they use. The code shown next to the carrier name is a combination of the Mobile country code (MCC) and the Mobile network code (MNC). The full list of MCC and MNC codes is available here. Please note that some mobile carriers may have several MCC+MNC codes. Allows you to target users who don't have a custom user identifier (iOS/Android). Apps with login walls or that require an account to make significant actions (purchase, etc) can use this option to increase the number of logged in users. The Transactions Tracked attribute allows you to target users who already have or haven't made any purchases in your app yet. This is useful to improve your onboarding process if you have an mcommerce app. Make sure you are sending custom data on transactions (iOS / Android) to use this attribute. Batch uses IP geolocation to find the city of your users. You can use this native attribute to target your users based on their last location. This feature works when the user is on a Wi-Fi network, not on a cellular network. Starting with Batch 1.8, you can track natively the location of your users (iOS / Android) for geotargeting purposes. This allows you to send contextual push notifications to users who have been seen in a specific area. All you have to do is to type an address and adjust the size of the targeted area (in meters). Please note that the SDK throttles location tracking to optimize network and battery usage. Batch can track one location event every 30 seconds. Geotargeting is available on the Startup plan and higher. You can easily retarget or exclude users based on the push notifications they have received or opened recently. This will work for any campaigns created from the dashboard or the Campaigns API over the last 14 days. 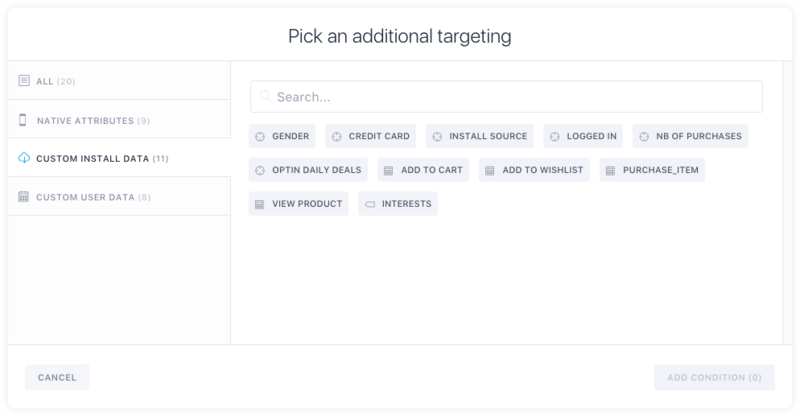 The "Retarget audience" attribute allows you to retarget or exclude users who have received a notification from a specific push campaign. You can use that condition to retarget users who have recently received a push containing a coupon code and forgot to use it. This is also useful if you want to target all your userbase, except users who were targeted by a specific campaign targeting a custom audience for example. The "Retarget opens" attribute lets you retarget or exclude users users who have opened a notification coming from a specific push campaign. This is helpful if you want to communicate with users who show interest for a certain type of content. You can also use that attribute to avoid bothering users who are not opening your notifications. Campaigns retarting is available on the Enterprise plan or as an option on other paid plans. With Batch you can track events and assign custom attributes to your users in order to send contextual notifications. Before targeting custom segments, you need to define a tagging plan and tag your app as explained in the documentation (iOS / Android). 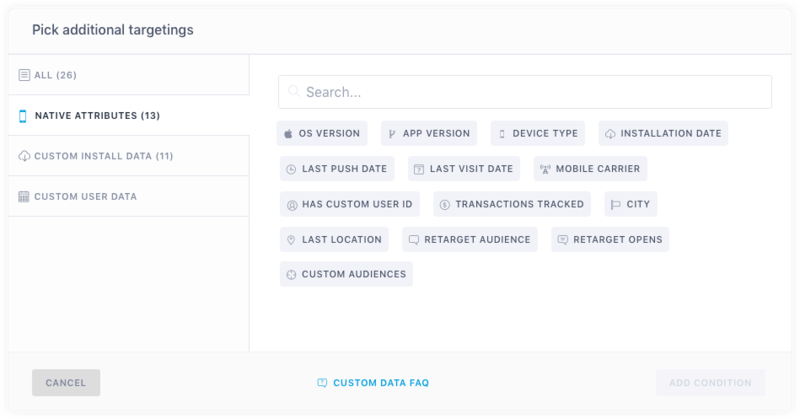 Take a look at this guide to know more on custom data and learn how to tag your app. Attributes can define users based on their settings (signup_date, etc), user profile (user_city, user_gender, etc) or their current status (nb_remaining_credits, etc). They can contain different type of data (string, number or decimal, boolean, date). Improve your onboarding flow (e.g. "Post a comment and be part of the events" if has_commented is false). Optimize your inapp content sales (e.g. "Hurry! 40% off on our coins packs!" if nb_remaining_coins < 5). Target the right users (e.g. "Free delivery today for our London users!" if user_city is "London"). A tag is a collection of strings. Tags may be called Channels or Topics with other push providers. The difference is that Batch attaches a "tag" to your user and will only make the list of users once you have created your campaign on the dashboard or from the API. Users interests: You can use a tag collection to know what your users' favorite brands/items/etc are and send them contextual notifications. Thematic opt-in: You can also use them to manage thematic push optin in your app. Events allow you to target your users based on how they interact with your app (read_article, play_video, follow_user). Every event has a key, an occurence date, an optional label, and an optional data object. Entice users to come back (e.g. "3 news you cannot miss this week!" if they haven't read an article over the last 7 days). Invite your loyal users to share your app (e.g. "Enjoying the app? Invite your friends to unlock a special character" if they never invited friends). And many more, depending on your app and your tagging plan. The potential reach indicator shows you the approximate number of users who are going to receive your message, based on your current targeting options. It gives you a good idea of the impact your push campaign will have and helps you to understand how relevant your targeting is. You can also see the percentage of users who have opted in to receive push notifications by hovering the number of targeted users. Please note that the Potential Reach doesn't take into account devices using Batch Dev API key. Don't be surprised if the number of reachable users is 0 when you run your first tests.